The MGM Grand Hotel and Casino has been a popular destination on the Las Vegas strip since it opened it's doors in 1993. 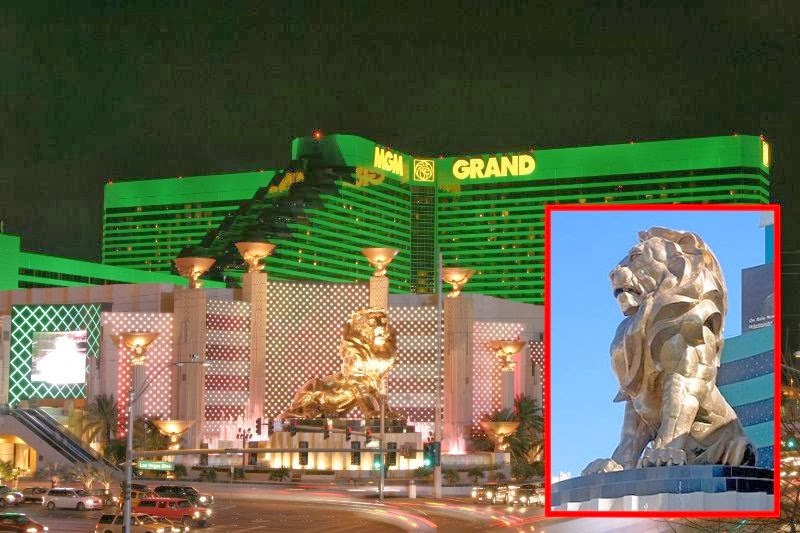 The imaginatively named 'Leo' the lion stands guard at the front entrance of The Strip's 2nd largest casino to greet the hapless gamblers, while the world famous bright green stripes on the outside of the hotel illuminate the night. Vegas is known for constant adaptation and reinvention to keep the people and their cash rolling in, but one of the major attractions at the MGM casino is almost as old as the building itself. The 'Lion's Share' slot machine is an archaic 3 reel machine with a progressive jackpot which has never paid out. Ever. The current jackpot stands at $2.3 million and there is a popular rumor that if the machine ever pays out then the winner would not only get a big bundle of bank, but also they would get to keep the machine itself. If you fancy your chances of winning the jackpot for a $3 stake you should be warned that the wait is a long one. The map below shows the location of the machine and the line of people waiting to play it. We spoke with some of the people in line and asked them "Why are you waiting in line to play The Lion's Share?" Leila Bentley - "My father used to play this machine 15 years ago and I am going to gamble my inheritance in honor of his recent passing"
Thomas Merkin - "Well it's ripe for it. It's ready to pay out after 20 years and I want that jackpot"
Alton Fairwether - "This is my first trip to Vegas and I want it to be memorable. Even if I don't win at least I can say I contributed to the jackpot"
Celia Wadding - "This isn't the line for Cirque du Soleil tickets?" Under Nevada gaming law, all slot machines must have a minimum 75% payout which means that the MGM Grand is stuck with the machine until it spews it's jackpot to cover the amount of money already 'invested' in it by hopeful gamblers. This machine is the last of a group of 50 identical machines commissioned by the MGM Grand over 20 years ago, the other 49 have already been scrapped having satisfied the Nevada Gaming Commission's requirement for 75% payouts. We spoke to Edwin Bally, a slot machine expert, about the possible causes of a delayed progressive jackpot. "There are 3 probable factors for the machine being so 'tight'. 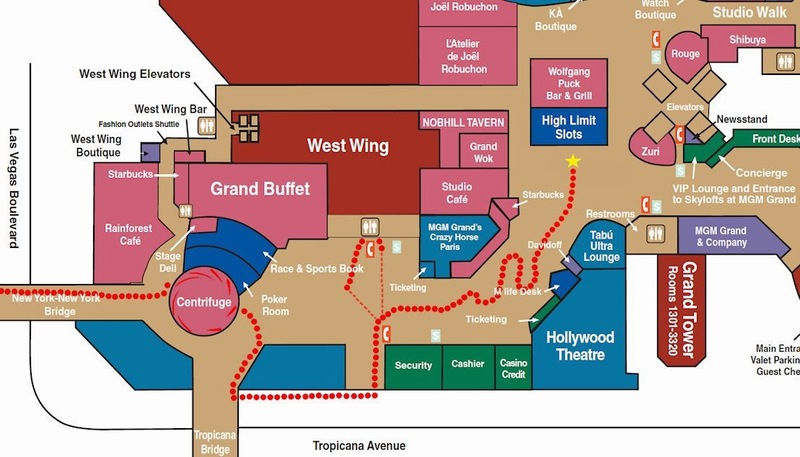 First, MGM had it programmed that way, the same way they put loose slots in key traffic areas, they planned to put a tight machine where a good crowd benefits the casino, in this case right by Starbucks and the high stake slots." "Secondly there could be a malfunction with the machine which it's own self diagnostic is not picking up. The 90's was an interesting time of transition for slots machines as new (and not fully tested) technology entered the slots arena." "Third, and most likely, Daniel Ocean is behind it. He has a history with Terry Benedict and the MGM Grand and would love nothing more than to screw with him again. 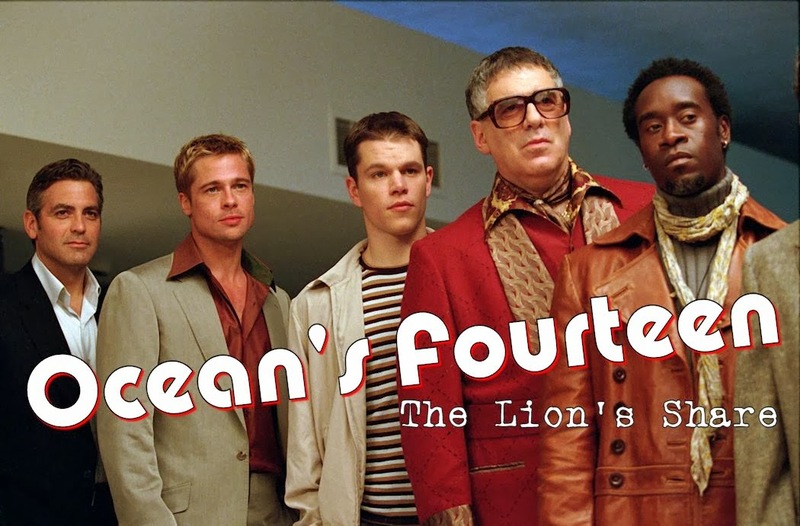 If you see any of the following shady looking characters hanging around the machine, you know it's about to pay out." If you are interested in getting the latest updates on the Lion's Share jackpot status then you can subscribe to the machine's Twitter and/or Facebook account. If you won the $2.3 million jackpot, what would you do with the money? Let us know in the comments section below. EDIT: Aug 23rd 2014 - The Lion's Share finally paid out it's jackpot to an old New Hampshire couple who probably won't live long enough to spend it all. A spokesman for MGM Grand said, "Finally we can get rid of that damn machine, it was 20 years old and used way too much electricity. We will be replacing it with a newer more efficient slot machine or maybe a virtual concierge terminal." Now you making me want to go to Vegas and line up for a few plays of this machine. Sounds like its just about to burst... assuming the thing actuary works. If I won the millions, I would set up an amusement park for kittens, one with lots of slides, spinning fish endowed mobiles, and laser pointers shining off disco balls all over the floor. Bubes Says - Are these medals smaller than usual? Johnson vs Jordan – Who was better?